Situated within one of China's most impressive buildings, this superb business address provides a prestigious venue for your organisation. There is an excellent range of business support services available, and the site is ideally located close to major transport connections. The center is surrounded by an excellent array of local amenities including five-star hotels, renowned restaurants and shopping malls. The centre is in Jianghan Road which is a Central business district in Hangzhou. You can easily access to the centre by Metro 1 or by Bus number 138, 195 or 1504The centre provides private office, hot desk, front desk, meeting room, open area, mini kitchen, event venue, café, game room. There’re blackboards to share your ideas, kitchens to make sandwiches and rooftop gardens to seek inspiration. This is a Grade A office building located in the heart of the Qianjiang New CBD area. It is surrounded by several commercial complexes, international five-star hotels, restaurants. The centre provide free coffee, beverages and tea in the pantry, Office cleaning and maintenance twice a day, printers, scanners and photocopiers in public print room, shared telephone room with high quality and Public meeting area and rest area. This modern high-rise office tower in Hangzhou features low radiation glazed windows, quality granite cladding, a solar-controlled swimming pool and a rooftop helicopter pad. There is 24-hour security, and a multilingual conference centre. The centre is located in the Huanglong area, adjacent to the prestigious Zhejiang University, just 10 minutes’ walk from Hangzhou's beautiful and renowned West Lake, and also 10 minutes’ walk from the landmark Yellow Dragon Stadium. It is within the core of the Hangzhou High Technology Development Zone, and is in close proximity to the Provincial Government, the Municipal Government, Hangzhou Customs Office, the local tax bureau and other government organizations. The centre is in a downtown mega financial center in North shuicheng Road. There are many Fortune 500 companies in this area. You can easily access by bus number 148, 286, 450 or 467. The centre provides private office, hot desk, front desk, meeting room, open area, mini kitchen, event venue, meditation room. The centre is surrounded by banks and cafe/restaurants which can provide you lot of lunch options. 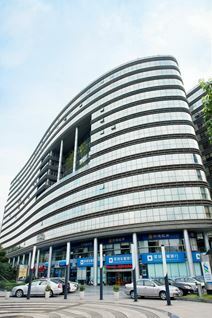 This business centre is located in Hangzhou's downtown CBD area, and is surrounded by the provincial office of many foreign banks. The centre is owned by the Provincial Foreign Economy and Trade Bureau. Hangzhou is just 1.5 hours away from Shanghai by train, and has been named by Forbes magazine as China's most business-friendly city for two consecutive years. This commercial complex consists of a shopping mall, luxury residence, a hotel and an office tower. 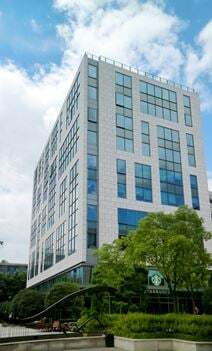 On the 7th floor the business centre provides a range of shared and private flexible office space in the heart of Qianjiang, the new Central Business District in Hangzhou. The centre provides private office, hot desk, front desk, meeting room, open area, mini kitchen, event venue and meditation room. The centre located in Hangzhou's first land CBD area. you can enjoy the breathtaking sight of the river from the centre. You can easily access the centre by bus number 1 or 79 or by ferry. The centre is surrounded by comfortable hotels and restaurants which provide you lots of lunch options. Just Announced - The centre is in Xueyuan lu. You can easily come to the centre by metro at Xueyuan Road station or by bus. The centre is surrounded by hotels and commercial buildings. The centre provides phone booths for conducting private calls and video chats, fruit water to keep you hydrated, meeting rooms for you to hold a meeting, cleaning services to tidy up your work place and social event for you to join so you can meet up with your coworkers. This centre is surrounded by serviced apartments, hotels, banks, restaurants and more. The centre offers a range of solutions for your business, and is available now. The area is home to a large number of financial and investment companies. Newly opened, the centre offers ultra-modern serviced office facilities with luxurious fittings, ample filing space, and several meeting rooms. Beverages are available to keep you hydrated and on the go throughout the working day. 24 hour access allows you to work at times that suit you. Situated in the heart of Hangzhou in the Kerry Centre, at the junction of Yan’an Road and Qingchun Road. Located in the surrounding area, you can find a high-end shopping mall and lavish residences. There are also a wide variety of bars and restaurants to entertain guests or celebrate success. Conveniently located on top of the interchange station for Metro Lines one and two. Opening soon. A well-equipped office space offering hot desk, dedicated desk, and stunning private office options. The onsite management team is a source of support during the working week. High speed Internet is accessible throughout. IT support is available, as well as postal handling and office supplies. Phone booths are perfect for quiet phone calls. Meeting rooms can be booked, and are equipped with A/V gear. Situated in a prime business location. Longxiangqiao Metro station is just moments from the building, enabling an easy commute to work. Close-by, there are a variety of bars and restaurants. There are also a number of hotels. It is a three minute walk to West Lake waterfront park.